You may have some limitations on that, but you can often tweak, reconfigure, or otherwise change the layout of your facility so that it is more productive, uses its space correctly, or reduces overhead costs. It’s always better to have future capacity and not need it than it is to need it, but not have it. Plan on expansion. 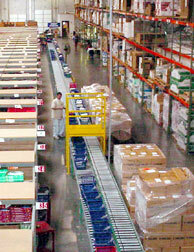 Plan for overstock (long or short term), common in today’s warehousing environment. Your plans should accommodate shifts in business, inventory, or process changes for a decade. A good example is “air space”. You may not need it currently, but a good plan notes that you can erect taller pallet racks, or even a mezzanine to take advantage if that’s needed. The ability to add those pallet positions, and knowing that you can, may be critical. left: even if you don’t need 20’+ tall racks today, you may in a few years. Consider facility height as you design for the future. This principle can also apply to rack capacities. If your current loads are in the 1,500 pounds per pallet position range, you may want to specify beams and uprights capable of 2,500 pounds in case your load weights increase. Yes, the heavier racks are more expensive, but loading flexibility is priceless. Adequate void space to set up temporary storage, work areas, or overstock storage should be factored in. You can also make simple errors like inadequate space for common areas – aisles, dunnage, equipment parking, employee areas, work cells, etc. Are there too many doors, or not enough? Map your current and future processes before you touch that CAD software, or even start scribbling on notepads. How will you manage your operation today? How might that change in 3 or 5 years. Base your conveyors, racks, shelving, picking equipment, and workcells on that process map. Not all warehouses, of course, ship to external customers. Warehouses that provide stock to a manufacturing operation must place raw materials and packaging close to the production area, in such a way that the production floor’s demands are easily met. Then it must be able to ship finished goods in a relatively straight line operation. Did corporate management involve warehouse managers/workers? You’d be surprised how frequently the people who work in a facility aren’t included in expansion, initial layout, or renovation plans — and how often that results in problems and bottlenecks for years to come. If location, floor plans, and design are dealt with by someone in a corporate role, the team will tend to react, rather than act. Inefficiency is all but guaranteed. Processes then must be changed to deal with layouts, rather than the more desirable situation where processes dictate layout. Include team members from every department at some point in the planning process. The kinds of information that can come from this participation is often surprising, and extremely useful. In particular, if your picking, packing, receiving, and material handling teams are energetically consulted by managers willing to listen, outsize productivity gains are very possible. Know your goals in advance: If you define your internal objectives in advance, everything else becomes easier. Do you want to minimize labor costs for picking/packing/shipping? Maximize storage density? Is this a lean operation? Is the focus on organization and ease of stock access/selectivity? Do you have a slotting methodology in mind so that you can position storage equipment correctly to service it? Knowing which areas will be your focus is critical when you create a layout. When you clearly match locations to functions, your warehouse functions much more efficiently. Failure to do this can cause improper work flows. In a fast-paced operation, it’s critical for planning and layout strategies that place both current and future tasks into defined areas. Where will the returned goods be processed? Where are the high-security inventory areas? Mark these areas clearly and enforce them. Functions will creep outside your layout if you don’t, and the poor work flow this can cause can be a productivity gremlin of the most annoying kind. Pick rate failures are usually blamed on pickers, and that’s often not the case. Warehouse operations that do not adequately plan paths between bin/shelf locations risk being handicapped by their layout, no matter the skill of order pickers. 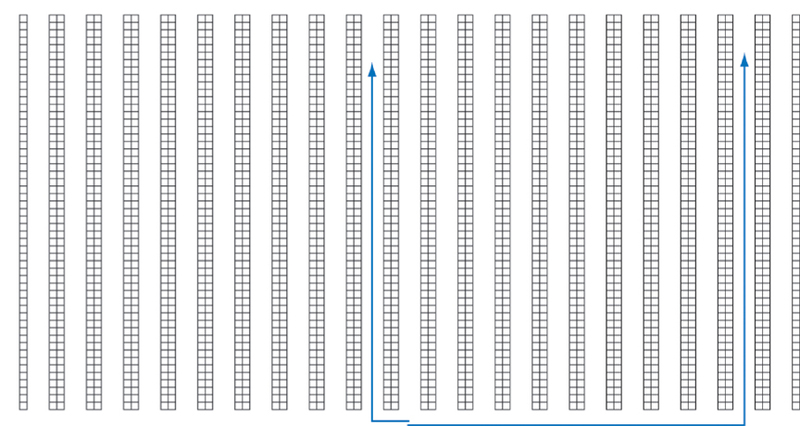 The pick path (the direction pickers move down aisles) should begin as far as possible from the shipping area, and end with the picker emerging at the shipping area at the end of his or her run. This is an uncommonly easy mistake to make when you are laying out a warehouse, but pick paths should be among your highest priority. Sketch your pick paths in advance and work other things around them so that pickers can execute in a single path. When the receiving docks are shortchanged on space, errors that translate inefficiency and inaccuracy echo throughout the entire facility. We make the case for a “supersized” receiving area here. Receiving areas are often short shifted for space, and the problems this can cause is significant. 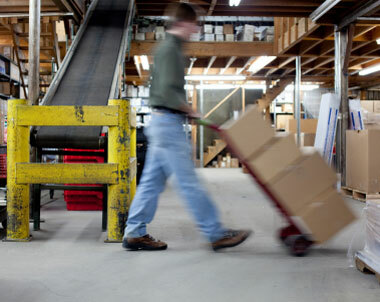 When should you expand or revamp your warehouse?